In life sciences, business reviews are conducted frequently in the commercial areas, especially sales, marketing, and market access. During these business reviews, leaders from different areas provide updates on what they’ve been doing, how well they’ve been doing it, and what’s next on the horizon. When does the Learning & Development (L&D) function get included? It’s less common for L&D to undergo a standalone business review (apart from cross-functional commercial peer groups), and more common for training to be included as part of a larger, multi-department franchise update, product launch status review, or other large commercial initiative. Most learning leaders are aware that gone are the days when it was acceptable to report on some rudimentary metrics. Historically, L&D teams could pull together their reports—and related performance metrics—on an ad hoc basis in preparation for these Training Business Reviews (TBRs). They got away with providing a range of activity-based metrics (e.g. Number of new hires through training; Average scores in training; Number of classes run), as well as some “softer” data points for TBRs. Generally, if the throughput was within range, the trainers were funny, and the cookies were great, it was all good. Such metrics were mainly useful for getting a baseline sense of overall satisfaction and for annual budgeting. Now, we are moving into an era in which those types of metrics will no longer cut it, and L&D Leaders are being held more accountable as contributors for performance and business success. L&D teams must begin to proactively collect metrics that more directly relate to core business objectives. In addition, those metrics must be collected in an objective, disciplined, and ongoing manner…not in an ad hoc way to prepare for an upcoming TBR. Below, we take a look at what those metrics should be. We also explore the key components of a useful and valuable TBR. To truly be a strategic partner, L&D must manage to metrics that go far beyond the basic ones mentioned above. There is value in those basic metrics…It’s just that they don’t go far enough. Higher-order metrics should relate directly to core business objectives of the company. 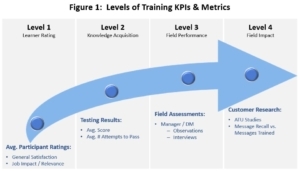 While the specific nature of those metrics can vary, it helps to consider them as being organized or aligned to Kirkpatrick’s four levels of evaluation, graphically represented in Figure 1. Level 1 metrics are the most basic. These metrics are derived by surveying the learners themselves to measure basic levels of satisfaction. One important key is to measure how relevant the learners think each training program is to their jobs. If surveys consistently tell you that learners think your training programs are irrelevant to their work, then that would indicate a problem. At Level 2, we begin to measure the extent to which learners retain the trained information. These metrics can include average test scores, the average number of attempts to pass, the first-time pass rate, and so on. Level 3 metrics go beyond measuring knowledge retention. They measure whether—and how—the learners are applying learnings in the field. There can be a number of ways to measure this. When the learners are sales reps, for example, collecting District Manager (DM) input is quite helpful. In such a case, DMs are tasked with observing rep actions during sales call ride-alongs. The L&D team can then interview the DMs, asking them to rate each rep’s performance, with particular attention to how reps applied learnings in the field, as well as the skill they demonstrated in doing so. Level 4 metrics help L&D begin to measure the impacts that training efforts ultimately deliver the business. These impacts should relate directly to business goals, and they’re very close to the whole reason for investing in training in the first place. L&D doesn’t spend money so that reps can know more…or even so they can be more professional in the field. Those are simply means to an end. The desired end-result for any training investment is the positive business impact that it ultimately delivers, however that impact is defined. The metrics used at Level 4 can vary significantly, depending on the business goals at hand. In some cases, collecting these metrics can involve surveying or interviewing customers to see whether they have heard and retained desired messages, or the extent to which their prescribing behavior has changed based on the reps communicating new messages and applying their training in the field. ATU (Awareness, Trial, and Usage) studies have long been a staple means of collecting data from customers, and they can be extremely helpful in tracking Level 4 metrics. If you haven’t seen ATU data in your organization, it might be a good idea to ask around—it could be a valuable data source in demonstrating the alignment, or misalignment between “what was trained” and “what customers heard.” If it’s aligned, then pat yourself on the back and congratulate your team for a job well done. If it’s not aligned, its time to move into performance consultant mode and try to diagnose the root cause of the gap. Assuming L&D has been collecting the proper range of value-added metrics in an ongoing and disciplined manner, it will be in a great position when TBR time comes around. So, how should L&D leaders organize their report and/or presentation for the TBR? In part, that depends on the degree of latitude that corporate leaders allow in the TBR process. However, below we’ll explore the components that L&D should work to include in any TBR presentation. Goals and Objectives – This section should outline the core goals that L&D is working to help the business achieve. It can also address department-specific goals for L&D. Key Performance Indicators (KPIs) – In this section, L&D should outline the metrics that it will use to evaluate its performance and value. As we’ve covered above, these metrics should relate to the core business goals, and can be arranged in Levels 1-4. This section should define each metric, link it to a goal, explain how the metric is measured, and set a performance standard for the metric. Performance – In this section, L&D objectively evaluates its performance against the KPIs. Strengths, Weaknesses, and Gaps – The name of this section pretty much explains it. Given L&D’s performance on the KPIs, the team’s leaders should be able to determine where its performance is strongest, where it needs improvement, and if there are any obvious capabilities gaps that need to be filled. Recommendations – The final section is the “so what?” Here, leaders outline their action plan for moving forward. This can include new business goals, plans for addressing weaknesses or plugging performance gaps, as well as the likely resources required. Done right, TBRs can become extremely valuable inputs for departmental strategic planning and budgeting. A well-constructed TBR will help an L&D department move beyond being seen as a cost-center that conducts on-boarding training, and instead be recognized for the strategic business driver that it is. And that will get your team the proverbial “seat at the table.” Now, go knock their socks off! How about you? Have you been recently asked to develop a TBR? What components did you include? Does your department have a lot of flexibility in formulating TBRs or are all departments forced into a templatized process? We’d love to hear from you.